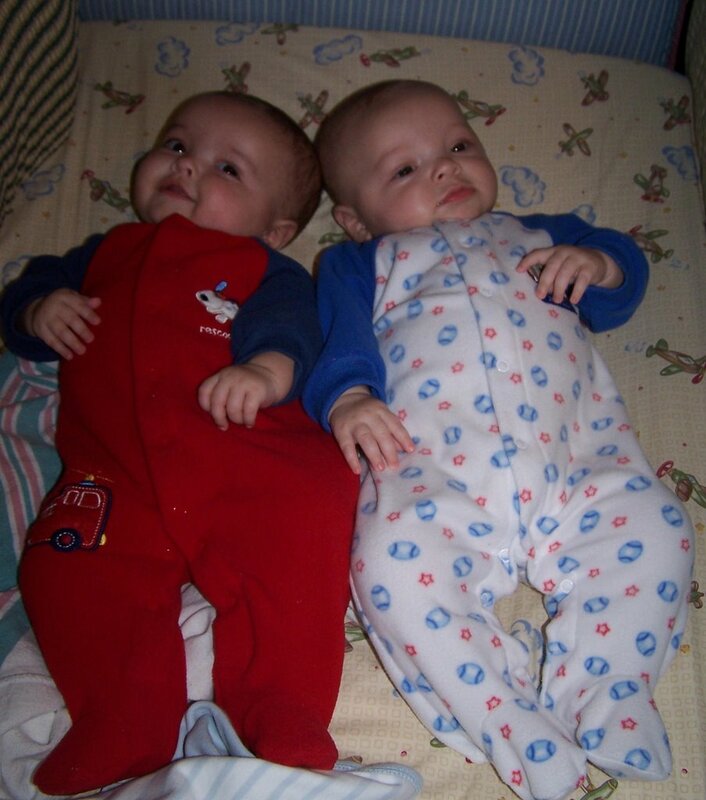 The boys had their 4-month checkup on Friday. According to Dr. Skaug, they are doing great. Some new stats... Hayden now weighs 15 pounds and is 26 1/2 inches long. Carson is starting to gain on Hayden a little, weighing in at 13 pounds & 6 ounces, and is 24 3/4 inches long. They had to get shots at this visit, but it didn't seem as bad as the last time. We decided to try a little sugar water on the pacifier to see if it made a difference. It worked really well for Carson, he didn't even make a noise during the first shot, and only whined for a bit with the second two. Hayden was already unhappy to be there (he needed a nap), so the pacifier did nothing for him. But, he doesn't tend to take the pacifier much anyway. So, all in all, everyone is doing great! Here is a picture of them that night in their pjs. Yeah!! Great weights! Good job boys, you look so cute in your PJ's. Keep up the great work mom, they look great!